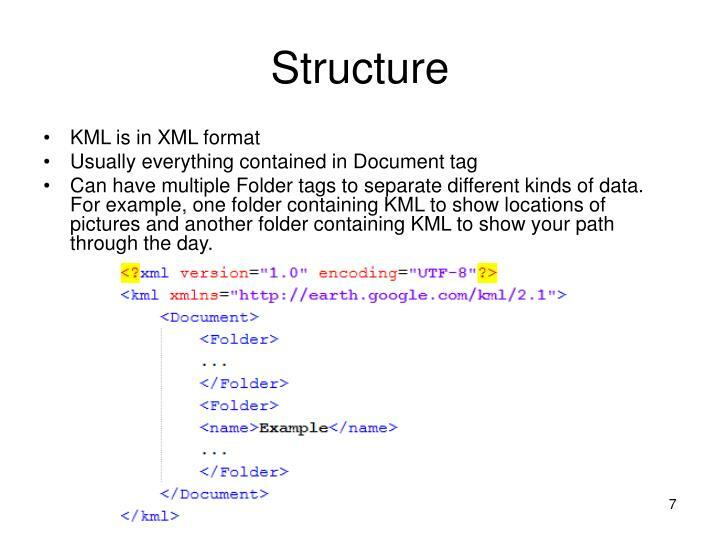 It’s XML so it follows a case-sensitive tag-based structure with nested elements and attributes. Currently in v2.1. Google has v2.2 in beta right now. 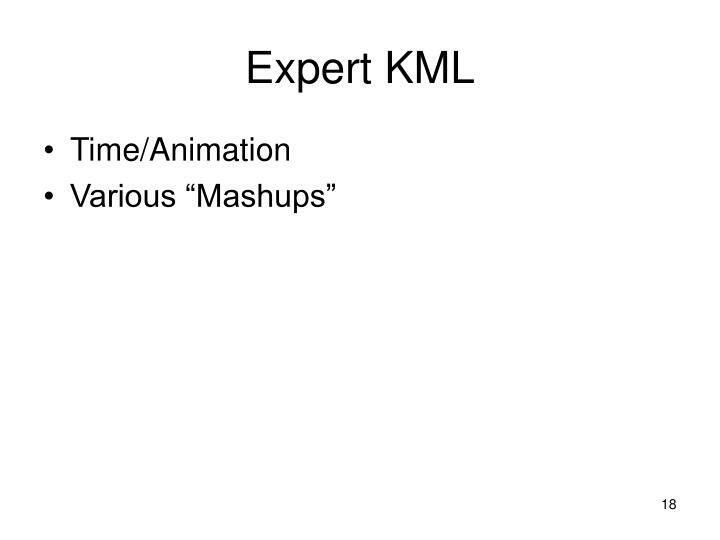 KML is very extensive. 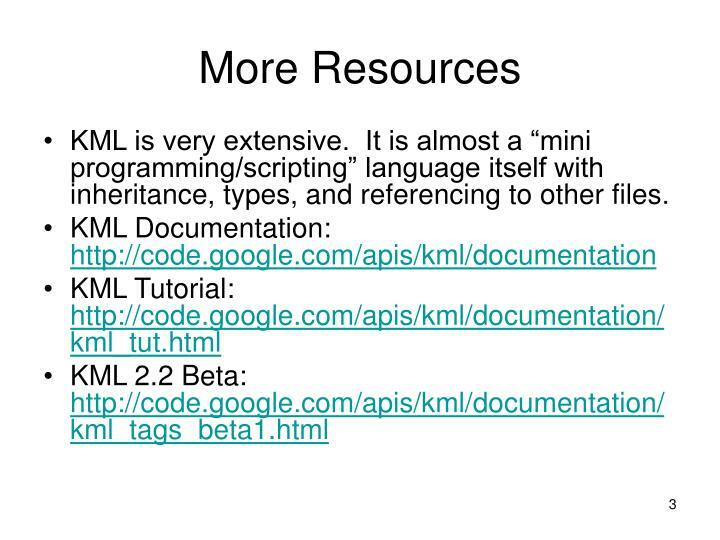 It is almost a “mini programming/scripting” language itself with inheritance, types, and referencing to other files. Everything is an “Object”. 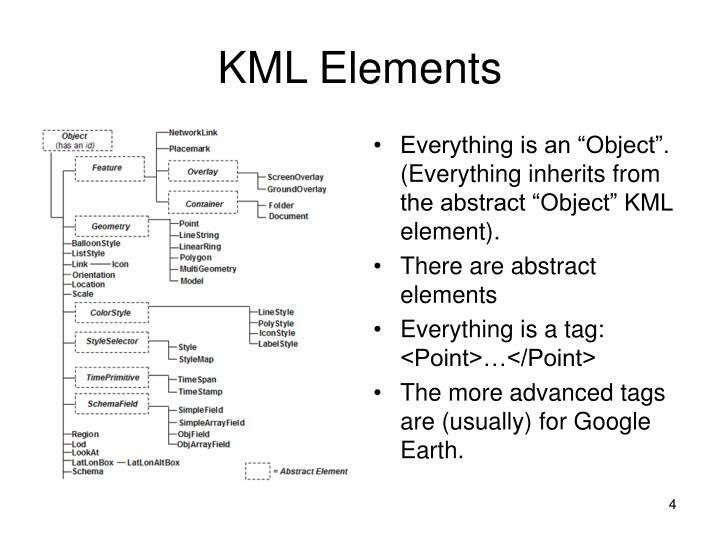 (Everything inherits from the abstract “Object” KML element). 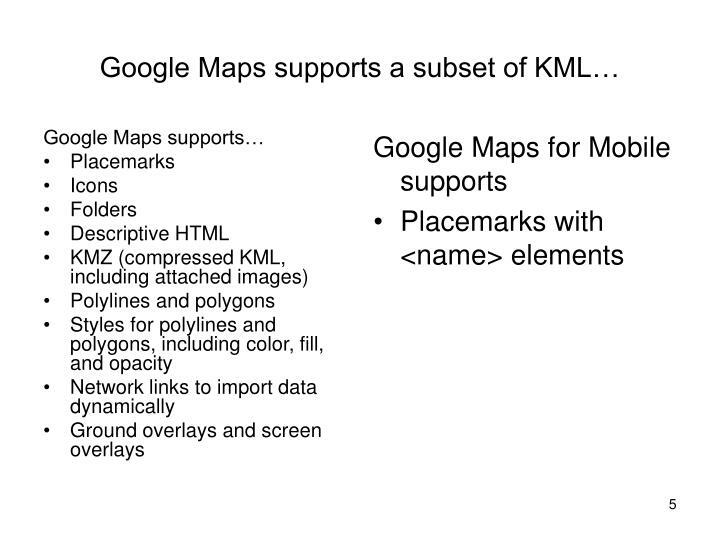 The more advanced tags are (usually) for Google Earth. Can have multiple Folder tags to separate different kinds of data. 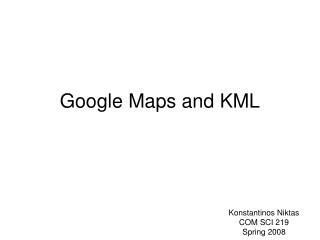 For example, one folder containing KML to show locations of pictures and another folder containing KML to show your path through the day. 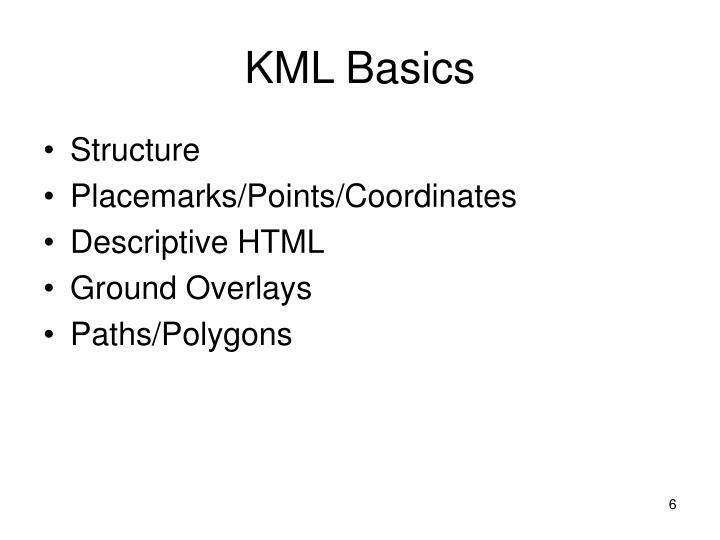 The easiest element in KML. A simple point on the map. It only needs a name and a location. You can give it a description too. 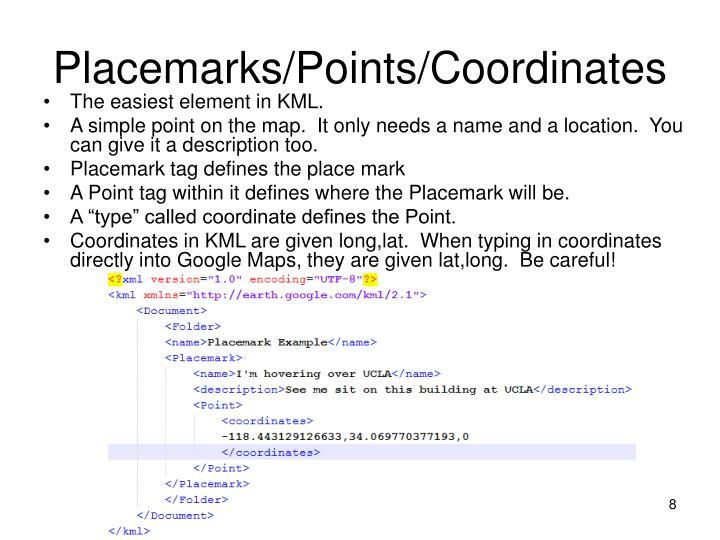 A Point tag within it defines where the Placemark will be. A “type” called coordinate defines the Point. 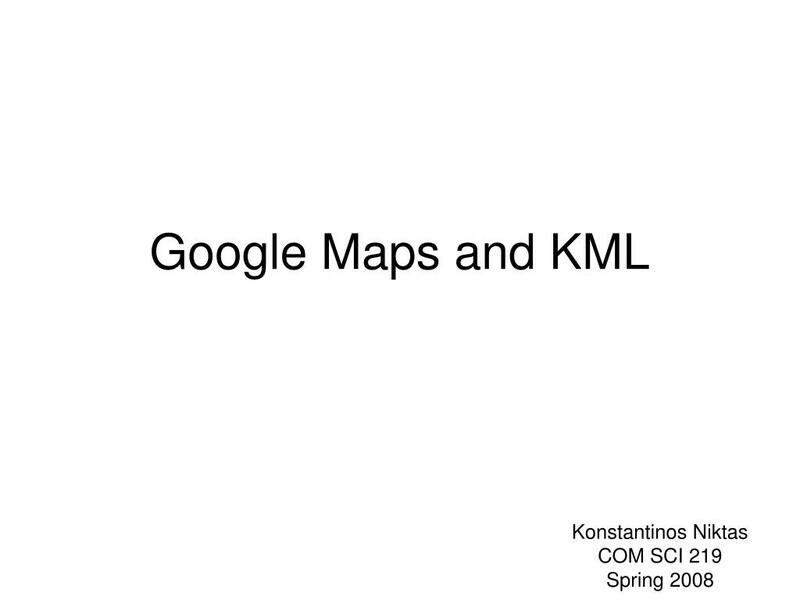 Coordinates in KML are given long,lat. When typing in coordinates directly into Google Maps, they are given lat,long. Be careful! 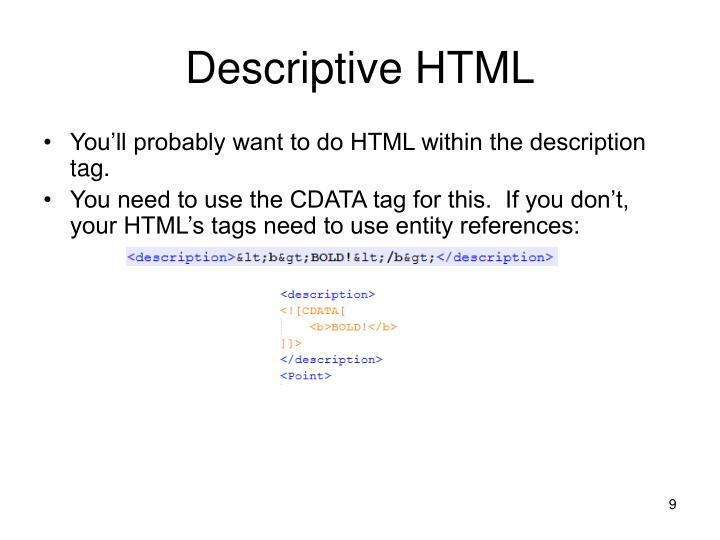 You’ll probably want to do HTML within the description tag. You can add an image onto the map. (For example, some kind of thermal map or your own satellite imagery). Defined by an image file and a LatLonBox element. 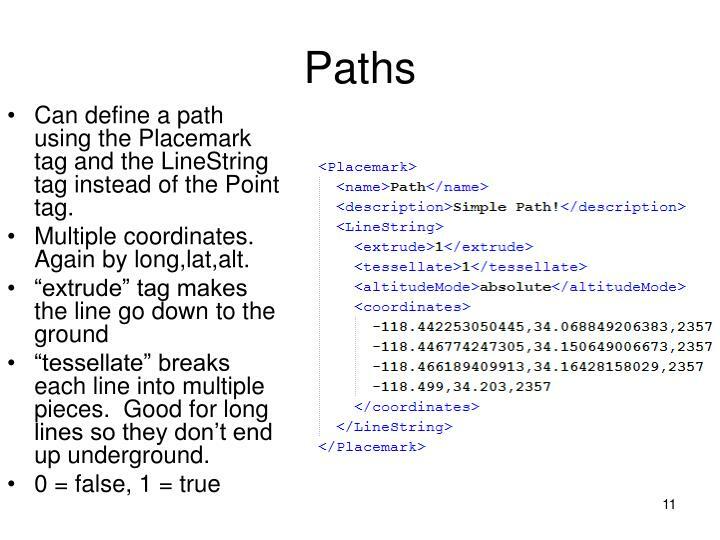 Can define a path using the Placemark tag and the LineString tag instead of the Point tag. Multiple coordinates. Again by long,lat,alt. “tessellate” breaks each line into multiple pieces. Good for long lines so they don’t end up underground. The boundaries are themselves defined by ‘LinearRing’ elements. 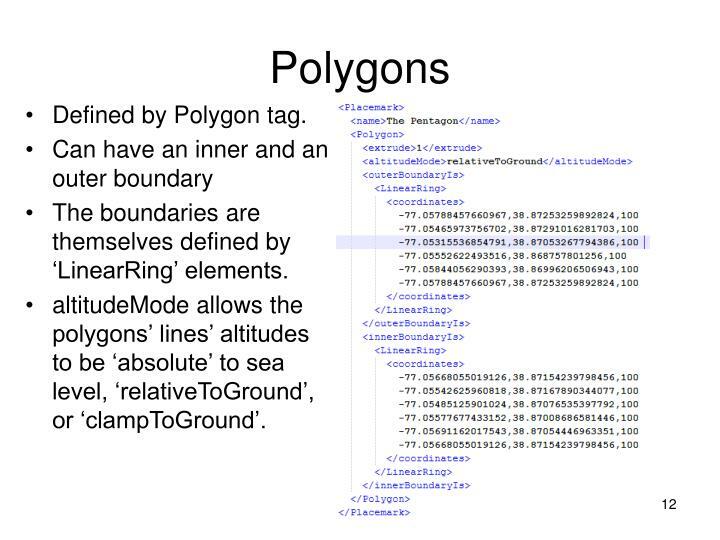 altitudeMode allows the polygons’ lines’ altitudes to be ‘absolute’ to sea level, ‘relativeToGround’, or ‘clampToGround’. In a Style tag. 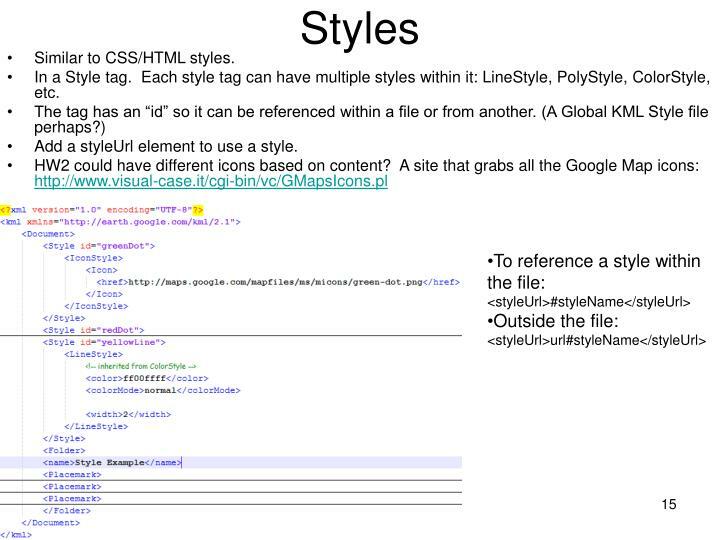 Each style tag can have multiple styles within it: LineStyle, PolyStyle, ColorStyle, etc. Add a styleUrl element to use a style. 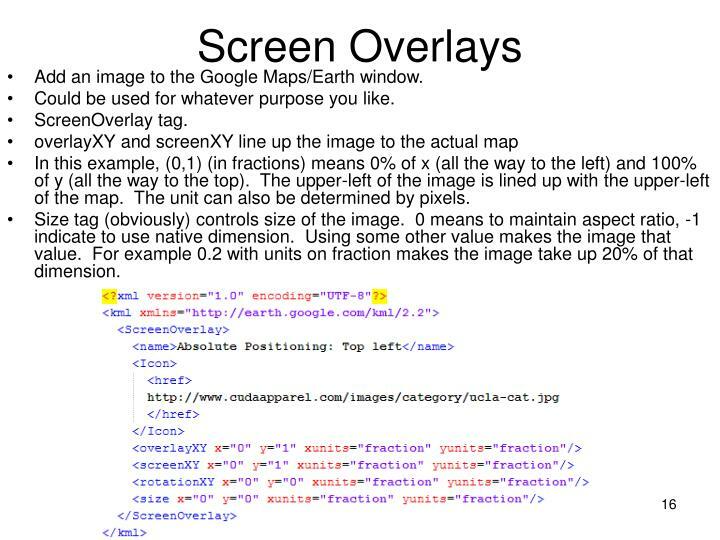 Add an image to the Google Maps/Earth window. Could be used for whatever purpose you like. In this example, (0,1) (in fractions) means 0% of x (all the way to the left) and 100% of y (all the way to the top). The upper-left of the image is lined up with the upper-left of the map. The unit can also be determined by pixels. Size tag (obviously) controls size of the image. 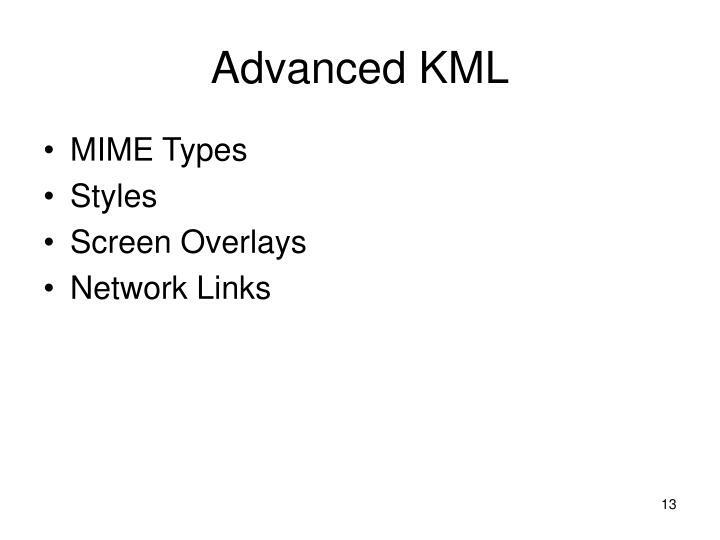 0 means to maintain aspect ratio, -1 indicate to use native dimension. Using some other value makes the image that value. For example 0.2 with units on fraction makes the image take up 20% of that dimension. 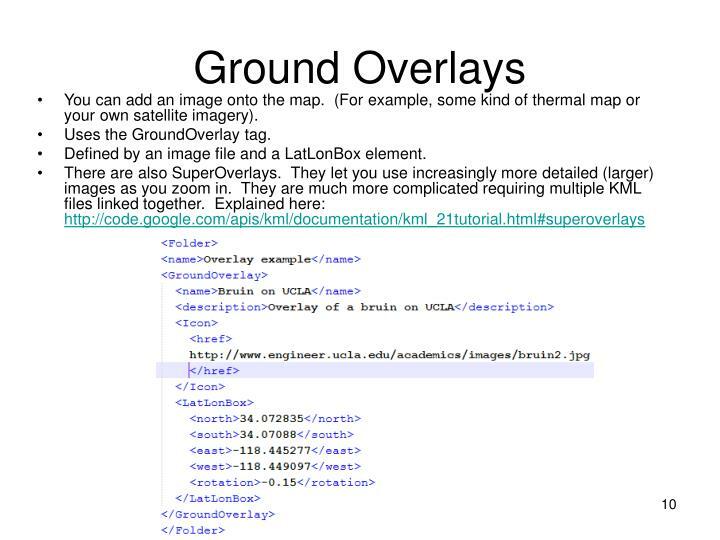 Allows importing of KML, KMZ, and image files for ground/screen overlays. 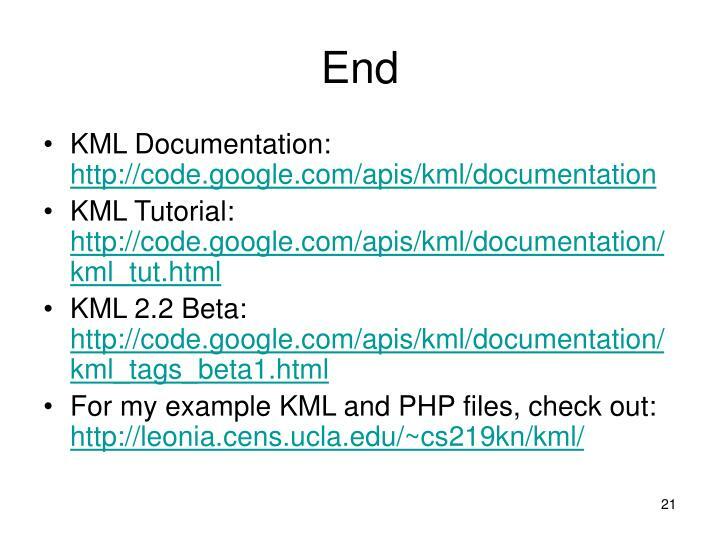 Good way to split up large KML file into much smaller KML files. More manageable. Usually uni-direction data flow (server to map) but when using “viewRefreshMode”, the map can pass the script information on what is being viewed (the LatLon box). 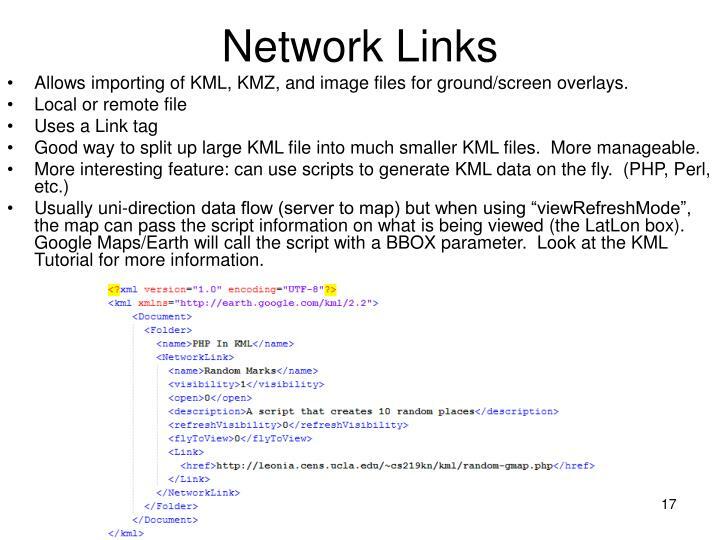 Google Maps/Earth will call the script with a BBOX parameter. Look at the KML Tutorial for more information. 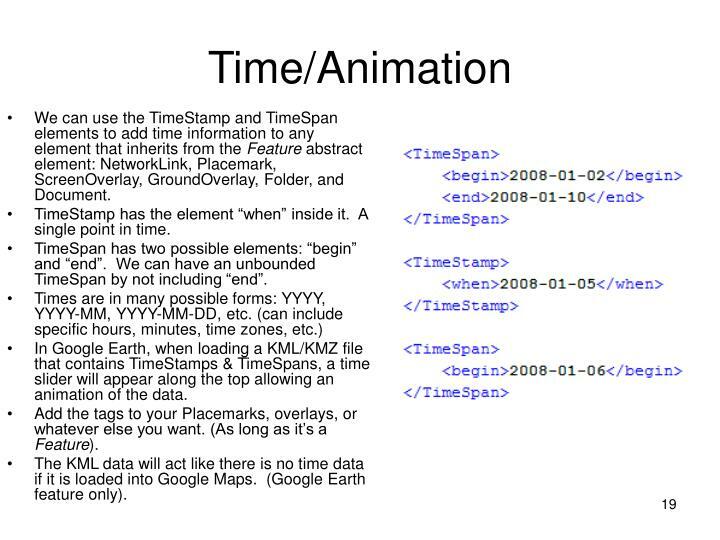 We can use the TimeStamp and TimeSpan elements to add time information to any element that inherits from the Feature abstract element: NetworkLink, Placemark, ScreenOverlay, GroundOverlay, Folder, and Document. TimeStamp has the element “when” inside it. A single point in time. TimeSpan has two possible elements: “begin” and “end”. We can have an unbounded TimeSpan by not including “end”. 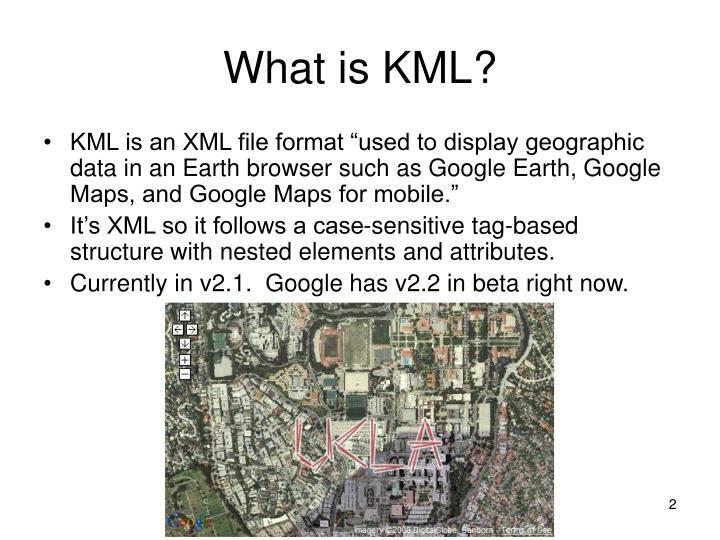 In Google Earth, when loading a KML/KMZ file that contains TimeStamps & TimeSpans, a time slider will appear along the top allowing an animation of the data. 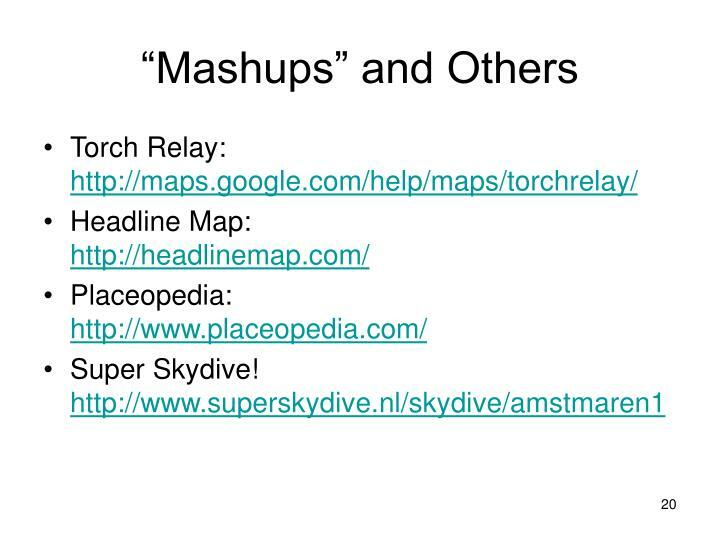 Add the tags to your Placemarks, overlays, or whatever else you want. (As long as it’s a Feature). 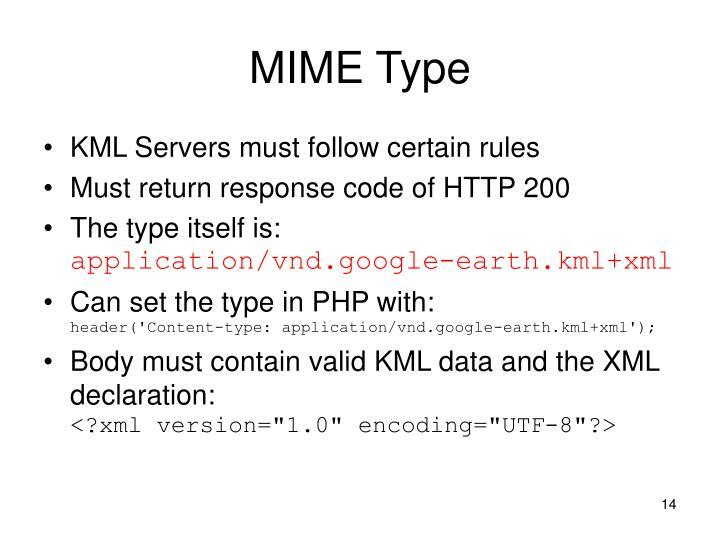 The KML data will act like there is no time data if it is loaded into Google Maps. (Google Earth feature only).